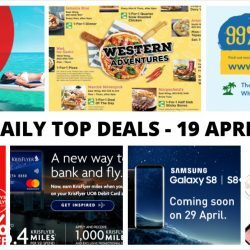 30 May 2017 BQ’s Daily Top Deals: SQ Special Fares to Europe, 1-for-1 Summer Frappuccino at Starbucks, KOI New Matcha Beverages at All Outlets, Guardian 2-Day Super Sale & More! Shop to your heart's content in June with all the GSS sales! Get up to 70% off at Robinsons, up to 40% off at The North Face and up to 80% off at Guardian! Enjoy 1-for-1 Summer Frappuccino at Starbucks, KOI's new Matcha beverages at all outlets from 1 June and $2 deals and free kids meals at IKEA! 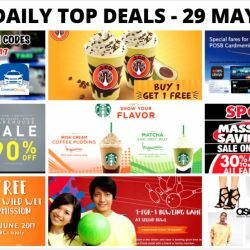 Other offers include: SQ Special fares to Europe, AirAsia 48Hr Flash Sale and the latest taxi codes..
29 May 2017 BQ’s Daily Top Deals: Latest Taxi Codes, 1-for-1 Beverage at J.Co Donuts & Coffee, Key Power Sports Warehouse Sale, 1-for-1 Admission to Wild Wild Wet & More! Save your money on your taxi rides with these latest coupon codes for more shopping! Also enjoy 1-for-1 deals from J.Co Donuts & Coffee, Wild Wild Wet and Orchid Bowl! Head to Key Power Sports Warehouse Sale for up to 90% off on sports gear and apparel! Other offers include: New Starbucks Frappuccinos, 20% off everything at ASOS, enjoy up to 15% off on Qatar Airways with DBS/POSB cards and Spotlight Massive Savings Sale. 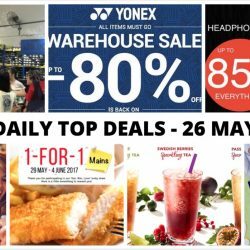 26 May 2017 BQ’s Daily Top Deals: Yonex Warehouse Sale, Converse Warehouse Sale, Hwee Seng Headphone & Hi-Fi Warehouse Sale, 1-for-1 Mains at Swensen’s & More! Plenty of major warehouse sales this weekend! Dun miss the Yonex, Converse (upcoming), Citigems, Hwee Seng Warehouse Sale to grab some great deals! Also next week, grab your friends and family to enjoy 1-for-1 mains at Swensen's with the deal in their app! Other offers include: AirAsia App Exclusive Sale and New sparkling drinks from The Coffee Bean & Tea Leaf! 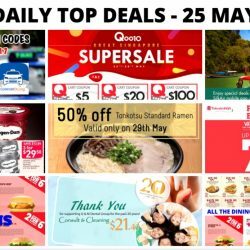 25 May 2017 BQ’s Daily Top Deals: Save $4 on Grab Rides, Takashimaya Fashion Labels Bazaar, Haagen Daz Ice Cream Offer, Latest Dining E-Coupons for May/June & More! Check out the latest taxi code to save $4 OFF your Grab rides between 10am - 12am! Save on your shopping on Qoo10 with up to $100 cart coupons and at Takashimaya's Fashion Labels Bazaar with up to 70% off Timberland, Vans and Napapijri! Save on your meals with deals like 50% off ramen, Haagen Daz Ice Cream 3 for $29.50 offer at NTUC FairPrice and latest dining coupons for May/June! Other offers include: SilkAir App Exclusive MasterCard Fares and Q&M Dental Group offer. 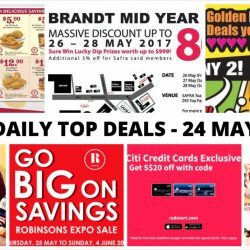 24 May 2017 BQ’s Daily Top Deals: Popeyes Coupons, Robinsons Expo Sale, Brandt Mid Year Sale, Long John Silver’s Mix & Match 2 for $10 & More! Save on your meals with Popeyes coupons and Long John Silver's Mix and Match 2 for $10 deals! Enjoy 1-for-1 Hokkaido Ice Cream after that at Rive Gauche! Do your shopping at Robinsons Expo Sale, Brandt Mid Year Sale and Tommy Hilfiger GSS! Shop for your groceries at Redmart with Citibank Credit Cards and save up to $20! 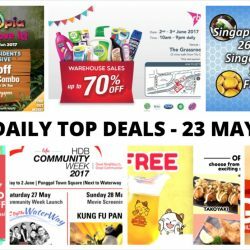 23 May 2017 BQ’s Daily Top Deals: $20 OFF Entry to Singapore Zoo & River Safari, RB Warehouse Sale, Singapore Food Expo 2017, HDB Community Week 2017 & More! Local residents, you are in for a treat! Bring your family to Singapore and River Safari during the June holidays and enjoy $20 off admission! Also major events to go for: RB Warehouse Sale with up to 70% off household products, Singapore Food Expo 2017 with many delicious food to try and HDB Community Week 2017 with free activities such as workshops and movie screening! Other offers include: Free jug of beer or your favourite snacks at Karaoke Manekineko and up to 40% off supplements and vitamins at Guardian. 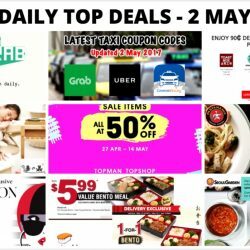 22 May 2017 BQ’s Daily Top Deals: Latest Taxi Codes, 1-for-1 Onsen Entry, Coach Outlet Special Sale, Cotton On Great Singapore Sale & More! Save on your taxi rides everyday with the latest coupon codes! There are 7 new codes updated! Great Singapore Sale is here at Cotton On, so go and get a new outfit today! Also get a new wallet or handbag at Coach Outlet's Special Sale with up to 70% off. Bring your family or friends to experience Japanese Onsen today at 1-for-1! Other offers include: JYSK Renovation Sale, AirAsia Latest Sale, Wine Warehouse by Giant and more. 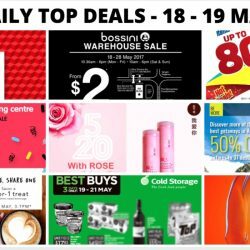 18 - 19 May 2017 BQ’s Daily Top Deals: Bossini Warehouse Sale, Consumer Electronics Expo 2017, 50% OFF at World of Sports, New Chun Cui He Rose Honey Milk Tea, 50% OFF Tigerair Fares for NTUC Members, Ben & Jerry’s Ice Cream Offer & More! Plenty of sales this weekend! Enjoy 20% off storewide at Guardian, deals from $2 at Bossini Warehouse Sale, up to 80% off electronics products at Consumer Electronics Expo 2017, 50% off storewide at World of Sports and more! Also grab the new Rose Honey Milk Tea flavour from Chun Cui He available progressively at 7-11 from 20 May onwards! Use the latest taxi codes to save on your shopping trips, book your next holiday on Tigerair with NTUC cards and enjoy 1-for-1 Starbucks drink from 22 to 24 May 2017! 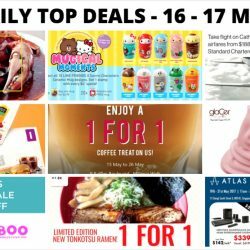 16 - 17 May 2017 BQ’s Daily Top Deals: Burger King E-Coupons, 1-for-1 meals and 50% off with Bank cards, NEW LINE FRIENDS X Sanrio Characters Ceramic Mug Designs at 7-11, Cathay Pacific Exclusive Fares with Standard Chartered Cards & More! Dun miss these offers: Burger King e-coupons, 1-for-1 meals and 50% off with Bank cards, new LINE FRIENDS X Sanrio Characters Ceramic Mug designs to collect at 7-11, Cathay Pacific Exclusive Fares with Standard Chartered Cards and Natures Collection Toys & Gifts Warehouse Sale! Also jio your friends to enjoy 1-for-1 coffee, 1-for-1 ramen, 1-for-1 frozen yogurt and more! 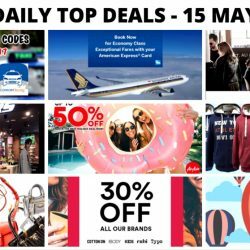 15 May 2017 BQ’s Daily Top Deals: Singapore Airlines Exceptional Fares with Amex Cards, Sketchers Great Singapore Sale, AirAsia Up to 50% OFF Sale, Isetan Private Sale & Coach Sale, Cotton On 30% OFF & More! Book your next holiday with Singapore Airlines' Exceptional Fares with American Express cards and AirAsia's up to 50% off sale! Also grab shopping deals at Sketchers' Great Singapore Sale, Reebonz's Friends & Family Sale, Isetan Private Sale & Coach Sale and Cotton On's 30% off flash sale! Other offers include: FREE Coffee at Singapore's first Melbourne Cafe pop-up at Millenia Walk, 1-for-1 Fleece Jacket at Universal Traveller. 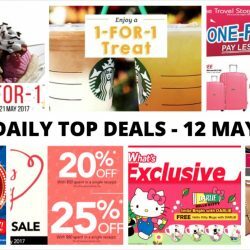 12 May 2017 BQ’s Daily Top Deals: 1-for-1 Swensen’s Sundaes, 1-for-1 Starbucks Drink, 1-for-1 Luggage Sale, Hello Kitty Limited Edition Mugs, BHG Super Sale & More! This weekend, enjoy 1-for-1 offers from Swensen's, The Travel Store and Starbucks! Also shop at BHG's Super Sale, Bee Cheng Hiang's Mother's Day Sale and Jetstar Travel in Style Sale! Hello Kitty fans, dun miss collecting the limited edition Hello Kitty mugs with every purchase of Darlie toothpaste pack! while stocks last. 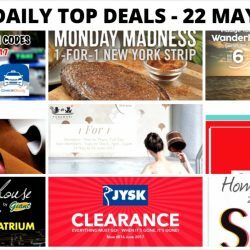 12 May 2017 BQ’s Daily Top Deals: Latest Taxi Codes, 50% OFF Ribena Sparkling, Metro GSS Sale, Esprit 30% OFF Storewide, KFC e-coupons & More! Grab Redmart's offer of 50% off Ribena Sparkling while stocks last! Also make use of the latest taxi coupon codes and KFC's e-coupons! Shop for your mother's day gift at Metro's GSS Sale, Esprit 30% off storewide sale, or even a holiday at Scoot/Tigerair's fare sale! Other offers include: NEW KFC Curry Crunch Chicken, Unlimited $0.99 GrabShuttle Rides, Toys"r"Us half price specials! 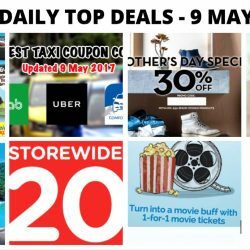 9 May 2017 BQ’s Daily Top Deals: Latest Taxi Codes, Ben & Jerry’s Ice Cream Offer, Timberland 30% OFF, SilkAir Promo Fares, 1-for-1 Movies & More! Check out the popular Ben & Jerry's ice cream offer at Cheers, while stocks last! Also dun miss Timberland's online exclusive Mother's Day special with 30% off, 1-for-1 movies at Cathay Cineplexes on 10th of every month with POSB PAssion Card, 20% off storewide Members' sale at Watsons and more! 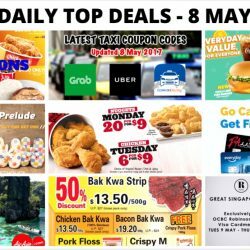 8 May 2017 BQ’s Daily Top Deals: Offers on Fast Food from McDonald’s, KFC & Jollibee, Craftholic Buy 1 Get 1 FREE Slippers, Robinsons GSS, $8 for 2 hour KTV, Latest Taxi Codes & More! Check out McDonald's NEW Extra Value Meals! Try the new Chilli Lime Fish Burger or Chicken BLT Burger Extra Value Meal today. Also grab KFC's Monday and Tuesday special offers on chicken nuggets and chicken! Or head to Jollibee with their latest e-coupons to save money on your meals on weekdays! Craftholic fans, grab the Buy 1 Get 1 FREE all slippers offer now! Other offers include: Latest taxi codes updated, 20% off AirAsia flights with OCBC cards, $8 for 2 hour KTV, Robinsons GSS and more! 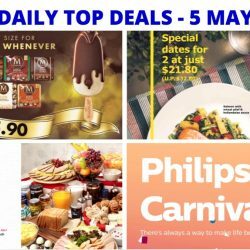 5 May 2017 BQ’s Daily Top Deals: IKEA 3-Course Meal Offer, IKEA Mother’s Day Breakfast Buffet, Magnum Limited Time Offer, Philips Carnival Sale & Latest Taxi Codes! Time to head to IKEA to shop and dine! Take advantage of their 3-course meal offer at only $10.90 per person or bring your mother to enjoy their Mother's Day Breakfast Buffet! Also grab the Magnum Minis at major supermarkets as they are on offer till month end! Mark the dates for the Philips Carnival Sale and head there to grab deals on home appliances and personal grooming products. Lastly save the latest taxi codes from Uber, ComfortDelGro and Grab for discounted cab rides! 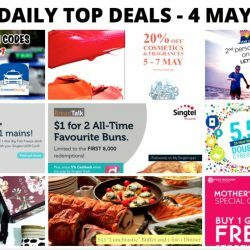 4 May 2017 BQ’s Daily Top Deals: Singtel Exclusive Offers from BreadTalk & Fish & Co., Metro 20% OFF Cosmetics & Fragrances, Star Cruises 2nd Pax at $50, Yves Rocher Buy 1 Get 1 Free Storewide & More! Specially for Singtel users, enjoy 2 all-time favourite buns from Breadtalk at $1 and 1-for-1 Mains at Fish & Co.! Limited redemptions only so hurry! Plenty of shopping to be done this weekend! Shop at Metro's 20% off cosmetics and fragrances, Reebonz's 12hr online sale with 17% off, Courts Double Cyber Day Sale, and Yves Rocher's Buy 1 Get 1 Free storewide offer! Other offers include: Star Cruises 2nd pax at $50, latest taxi codes, The Westin $32 Lunch & 1-for-1 Dinner Buffet! 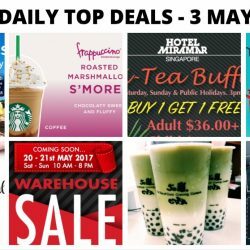 3 May 2017 BQ’s Daily Top Deals: Jetstar Citi Credit Cards Exclusive Sale, Hotel Miramar 1-for-1 Hi-Tea Buffet, KOI Matcha Latte Coming Soon, The Oaks Cellars Warehouse Sale, BHG Expo Sale & More! Book your flight for your next holiday on Jetstar with Citi credit cards and enjoy exclusive fares! Mothers' Day is upcoming, if you haven't decided where to celebrate, how about Hotel Miramar with their 1-for-1 hi-tea buffet, or Saveur with 15% off their lunch and dinner sets? KOI is also bringing the popular matcha latte from Taiwan into Singapore soon! Dun miss it! Other offers include: New Starbucks drink, BHG Expo Sale, Portopantry Factory Sale and The Oaks Cellars Warehouse Sale. 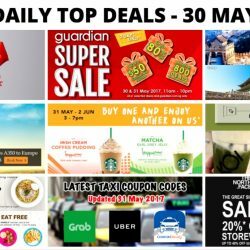 2 May 2017 BQ’s Daily Top Deals: Latest May Taxi Codes, Starbucks Goodie Grab, 90₵ deals with DBS/POSB Cards & Apple Pay, Sephora Private Sale, 1-for-1 Mains at PastaMania & More! Save on your taxi rides with the latest May taxi codes! Also grab goodies like 1-for-1 drink at Starbucks Goodie Grab game! Enjoy 90₵ deals at Toast Box, Starbucks and Uber with DBS/POSB Cards and Apple Pay. Save on your meals with 1-for-1 mains at Pastamania Bugis Junction, new value bento meals and 1-for-1 bento at Umisushi and $12.80++ steamboat buffet lunch at Seoul Garden! Other offers include: 50% off 2nd massage, Topshop/Topman Mid Season Sale and Sephora Private Sale with 20% off almost everything! 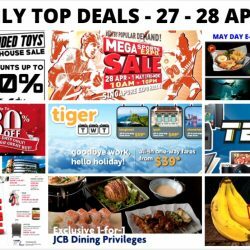 27 - 28 Apr 2017 BQ’s Daily Top Deals: Sheng Tai Toys Warehouse Sale, 1-for-1 & 50% OFF e-Coupons for NTUC Members, World of Sports Mega Expo Sports Sale, EuropAce Warehouse Sale & More! This long weekend there's plenty of sales and bargains waiting for you! Check out the Sheng Tai Toys Warehouse Sale for lots of bargains on toys from Bandai, Takara Tony and more! Also dun miss OG's 20% off storewide including prestige brand cosmetics, perfect time to get your Mother's Day present if you haven't! NTUC members, you are in for a treat with 1-for-1 and 50% off e-coupons and also additional discounts at EuropAce Warehouse Sale. Other offers include: Tigerair Mid-week sale, Qoo10 coupons, World of Sports Mega Expo Sports Sale, free banana ice cream at Gelare, Metro 1-for-1, latest taxi codes, UOB JCB card 1-for-1 dining offers and Harvey Norman Tech Expo 2017. 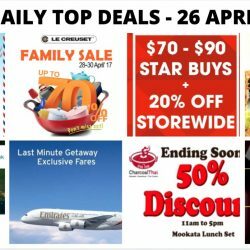 26 Apr 2017 BQ’s Daily Top Deals: New Balance Pre Renovation Sale, Metro Travel Fair, Goldlion Warehouse Sale, Le Creuset Family Sale, Charcoal Thai 50% OFF Ala Carte Dishes & More! Plan your next vacation with airfare offers from Emirates and Cathay Pacific! And enjoy dining deals from Charcoal Thai and Saboten! Also shop to your heart's content at New Balance Pre Renovation Sale, Metro Travel Fair, Goldlion Warehouse Sale and Le Creuset Family Sale! 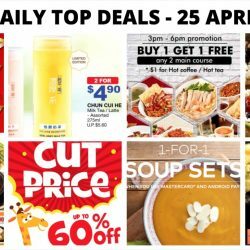 25 Apr 2017 BQ’s Daily Top Deals: Guardian 1 Day Sale, Toys “R” Us Mayday Warehouse Sale, Chun Cui He offer, Pepper Lunch e-Coupons & More! This week, save with dining deals such as 1-for-1 main course at Shan Cheng Ipoh Horfun, e-coupons for Pepper Lunch, 1-for-1 focaccia at Marche Movenpick, 1-for-1 soup sets at The Soup Spoon and $10 off your first delivery order at Miam Miam! Other offers include: Guardian 1 Day Sale, Toys "R" Us Mayday Warehouse Sale and Chun Cui He offer! 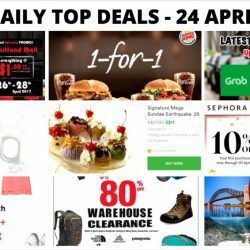 24 Apr 2017 BQ’s Daily Top Deals: 1-for-1 Burger King Ultimate Selection Meal Offer, Sushi Express $1 Promo, Outdoor Venture Warehouse Sale, 1-for-1 Coffee at Delifrance & More! Save the latest taxi codes for your daily use! Share the 1-for-1 Burger King Ultimate Selection Meal offer with your friends! Just pay with UOB cards via Apple Pay, UOB Mighty Pay or Android Pay to redeem! Also jio your friends to Heartland Mall for the Sushi Express $1 Opening Promo! Do your shopping this week at Zalora with 18% off, at Outdoor Venture Warehouse Sale with up to 80% off, at Qoo10 with their latest coupons and Sephora with 10% off your first order! Other offers include: AirAsia's latest sale, Swensen's Signature Mega Sundae Earthquake Groupon offer and 1-for-1 coffee at Delifrance! 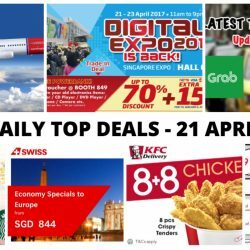 21 Apr 2017 BQ’s Daily Top Deals: Norwegian and Swiss Airlines Promo Fares to Europe from $199, Latest Taxi Codes, Digital Expo Fair 2017, 1-for-1 Drink at Starbucks & More! Flights to Europe just became more affordable! Check out Norwegian and Swiss Airlines' promo fares from just $199 one way! Also dun miss the latest taxi codes from Grab, Uber and ComfortDelGro! The Digital Expo Fair 2017 is also happening this weekend at Singapore Expo so head there for bargains on electronics products and home appliances. Other offers include: KFC Delivery offer, 1-for-1 limited edition summer drinks at Starbucks, Metro Dreams & Co. Fair and 30% off all Adidas watches at City Chain! 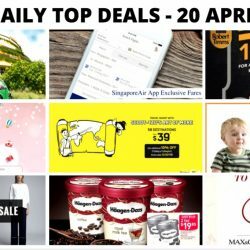 20 Apr 2017 BQ’S Daily Top Deals: SingaporeAir App Exclusive Fares, MILO Van at Safra Punggol, Korea Travel Fair 2017, Scoot/Tigerair Early Bird Sale Fares & More! Book your flights to Taipei, Colombo, Guangzhou, Bangkok, Tokyo, Munich & more from SGD70 on Singapore Airlines App! North-easterners, dun miss the MILO van at Safra Punggol this Sunday! Also indulge in Haagen-Dazs ice cream at NTUC Fairprice at 2 tubs for $19.85! Other offers include: Korea Travel Fair 2017, 1-for-1 deal on your choice of beverage - house pour wines, liqours, beers and ciders at The House of Robert Timms, Stride Rite Atrium Clearance Sale, Scoot/Tigerair Early bird sale fares, i.t Labels' mid-season sale and Takashimaya Fashion Bazaar 2017! 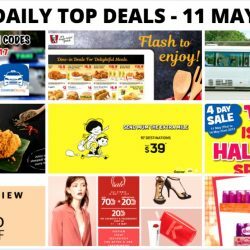 19 Apr 2017 BQ’s Daily Top Deals: ZUJI 99% Sale, 1-for-1 Dining Deals at Suntec City, Watsons’ 20% OFF Storewide, Latest Samsung S8/S8+ Telco Contract Prices & More! ZUJI's 99% sale is back again and you shouldn't miss it! The secret destination will definitely be one that's very popular, trust us! Also check out UOB's new KrisFlyer UOB account which you can spend and earn miles for your next trip! Suntec City is having 1-for-1 dining deals at many of their restaurants so check out the list in our post! And get your favourite beauty products at Watsons' 20% off storewide sale and BeautyFresh's 20% off major beauty brands like Chanel, NARS, MAC, Estee Lauder and more! Other offers include: AirAsia's flight + hotel sale, and the latest Samsung Galaxy S8/S8+ telco contract prices.